At Aquam Pipe Diagnostics, we are dedicated to providing best-in-class solutions for your pipeline asset management and condition assessment needs. 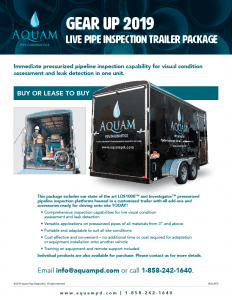 Now you can have the capabilities of live pipe inspection and leak detection all packed in one fully accessorized and mobile trailer. Learn more below. Aquam Pipe Diagnostics is a specialized technology provider focused on pipeline assessments and inspection solutions for all utility sectors. Get regular updates about the the latest products and news from Aquam Pipe Diagnostics.